Refer a friend to one of The RIGHT Shoe run clubs and receive 50% off your fee when you sign up together! Or, split the difference and each receive 25% off. Lara has over 20 years experience as a personal trainer, run and triathlon coach. 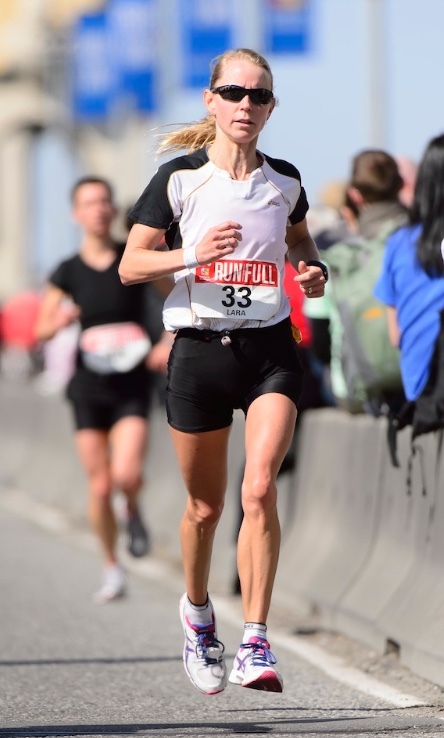 In Vancouver she has lead The RIGHT Shoe run (and tri) clinics for 13 years. Previously, Lara coached the Momentum Fitness triathlon club for 2 years and lead the Westmount YMCA women’s running club in Montreal for 2 years. On a personal level, over the past 22 years Lara has competed in over 50 triathlons including Ironman Canada in 1998, and too many road races to count ranging from 5k distance to marathons. She lead her varsity track and x-country running team at Concordia University for 2 years, receiving rookie of the year and MVP. Lara is passionate about running and exercise. She strives to pass this enthusiasm on to others through her coaching and personal training. Please feel free to contact Lara through email if you have any questions! Click here to email Lara Penno. I'm interested in joining a running club - what does The RIGHT Shoe offer? The RIGHT Shoe has three different distance running clubs that run throughout the year, once or twice a week. Learn to Run Club, 10K Tuesday Club and Half/Full Marathon Club. What are the benefits of joining these clubs? Incorporating a running/walking program into your daily routine can be a healthy and rewarding lifestyle choice. There is a multitude of reasons why people choose to begin an exercise program. For some it is an outlet for stress, for others it is to lose those extra pounds. It may simply be the joy of being active in an outdoor environment. Maybe you need a goal to focus on such as finishing the Sun Run, qualifying for the Boston Marathon, or entering your first triathlon. Whatever the motivation, it is our goal to give each participant helpful advice to improve his or her running. Training with a group provides motivation, camaraderie and support to keep you running and help you meet your goals. Club instruction helps ensure you are running properly to prevent injury and there is always someone on hand to answer any questions you may have. At The RIGHT Shoe we work hard to provide club members with a safe, informative, and most importantly, fun, environment to participate in this healthy and rewarding lifestyle. What sets The RIGHT Shoe Clubs apart from other clinics? Our clubs provide individual attention to each runner. Additionally, The RIGHT Shoe clubs are sponsored by Nike and New Balance, providing runners with additional perks. How much does the Run Club cost? The Learn to Run Club cost is $75 for 15 weeks+ tax. You may drop in for a fee of $6. The 10K Tuesday Club $75 for 15 weeks + tax. You may drop into Tuesday for $6 and Sundays for $10. The cost of the marathon and half-marathon clinic is $175+ tax. Drop in is $10. * prices may vary slightly depending on the number of weeks in each season session. Where and when do the Run Clubs take place? The Learn to Run Tuesday Club starts and finishes at The RIGHT Shoe, Tuesdays at 6pm. The 10K Club also starts and finishes at The RIGHT Shoe at 6:00 pm on Tuesday and Sundays at 8:00 am. The Marathon and Half Marathon club meet on Sundays at 8:00 am for the longer runs and Tuesdays at 6:00pm for intensity runs. Your registration includes top-notch instruction, invaluable fitness and health education and 15% VIP discount at The RIGHTShoe. Additional perks are included depending on the club you sign up for. At the end of the club there will be a social event to celebrate your achievements. How long do the clubs run for? The Learn to Run Run Club and 10K Club runs for 13-16 weeks depending on the season session and the Marathon/Half-Marathon Club runs for 16-18 weeks. Do I need to be at a certain level of fitness to join? The RIGHT Shoe clubs are designed for all levels. Our various pace groups cater to all types of runners, from walk/runners to 6-minute milers. Everyone in the group follows the same workout but, at their own pace. What should I expect when I show up for a run club? Meet at The RIGHT Shoe for most workouts. Lara Penno, our Run Leader, will introduce the workout and then we will head out on our planned route and begin our workout. Can I still sign up for the Run Club after it has started? Yes. However, if you have missed more than the first few session, it is recommended that you wait for the next session in order to reap the full benefits of the Run Club. Drop-in fees for all clubs are available - $6 for Tuesdays and $10 for Sundays. For more info, email run club coach Lara Penno and she will happily get you started on the right track.